Thanks, Jim! I will ask the RO and I’ll keep you posted. Personally, I would await my next PSA result before taking any action on treatment. However, the decision is absolutely yours. Thanks for the comment. I’m of the same mindset at the moment, and we’ll see what the urologist and radiation oncologist say. We’ve been on a four month test cycle, so my next test would be in December. I don’t know that there’s a need to increase the frequency to testing every 2-3 months, but it may be worth asking. Dan. Good to connect. You are well ahead of me on the journey. I’m sad to hear that the incontinence never goes away. I’m also a long way off having any sexual feeling. Thanks for your comment and for following along. The incontinence thing for me is a minor nuisance more than anything else. I generally go without pads and can do just fine. If I know I’m going to be more physically active (lifting in particular), I’ll stick a pad in for insurance. Be patient with your recovery—it took the better part of six months post-surgery for me to get it under control. As long as there was improvement, no matter how small, I was pleased. Regarding the trigger PSA level for opting for salvage radiation is concerned, I don’t know for sure. One of the urologists I spoke with a while back said if it got to the 0.15-0.18 range, that would be a time to act. I certainly would factor in how rapidly (or, thankfully, slowly) it’s increasing, too. 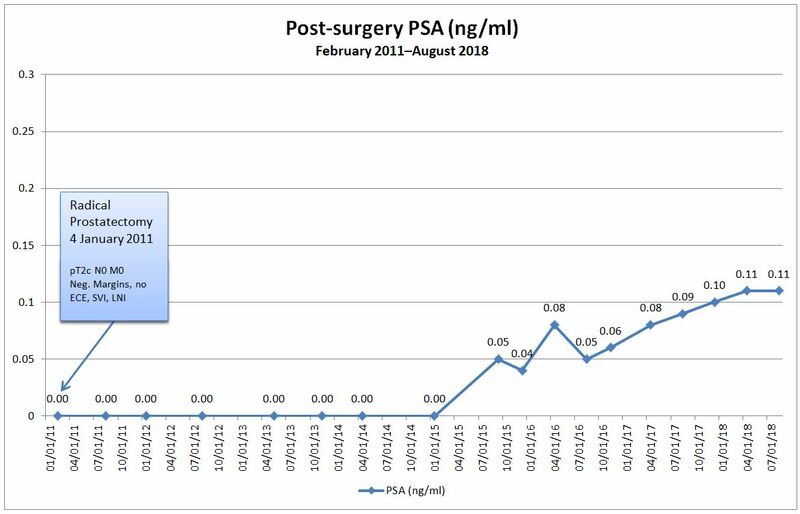 Charting my PSA increases, I may not hit 0.15 until August 2019 and 0.18 until August 2020. In that time, perhaps the accuracy of some of the newer imaging techniques will have improved to the point where it MIGHT be able to reliably pick up the cancer’s location at those PSA levels. I’m just starting with blogs. I like your style – what theme do you use? Also, how do you put the FB, twitter, etc icons on the bottom for sharing? Thanks. I’m using the “Lovecraft” theme for my blog. Go to the “Sharing Buttons” tab and select the different style of buttons (icon only, icon + text, etc.) and on what content (page, post, etc.) that you want them to appear on.